We at Skyward Interactive are really big fans of Twitter and feel that it is probably the first social network that has the chance to not only become a household name, but that has a chance to change the world. No doubt about it, Twitter is huge and going to get bigger. Because of this, we feel that there is room for one more Twitter app. Yes, we know there are already a lot of them out there, but just like in Goldilocks and the three bears, some are too hot and some are too cold. We wanted one that is just right, so we made our own! Tweetery is an astonishingly easy to use Twitter client. We’ve packed in a lot of features that you’ll use everyday, and in our quest for that app that is “just right”, we’ve also purposefully left out much of what makes most other iPhone Twitter apps overwhelming or confusing. We think you’ll like it because of it’s simplicity. – Elegant, Clean Design: Design is important. Apple knows it, and we believe in it. 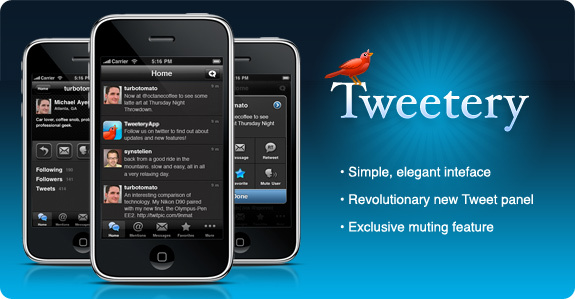 Tweetery offers great features without being overcrowded by lots of buttons. The simple interface puts the spotlight where it should be – on the tweets. – Muting Users: Our exclusive quick mute function is a lifesaver! You can easily hide someone’s tweets temporarily without un-following them when they talk too much. Mute people for a day, for a week or for as long as you want! – Quick Action Panel: The revolutionary “Quick action panel” is very simple to use and makes interacting with tweets a joy. By far the easiest way to tweet on the iPhone. Quickly and easily reply, retweet, direct message, favorite, jump to a user profile, mute a user, or email a link to a tweet– all within a tap. Mute users temporarily, no un-follow needed! I’m sure that we’ll add to this list over time. But since our goal is to keep the app simple, hopefully the list won’t grow too long. We look forward to making this the best way to Tweet on the iPhone and we hope that we can convince you to make this your default Twitter app. Follow @TweeteryApp on Twitter to join in the discussion about Tweetery. You can find out more about the app in the app store or by visiting Tweeteryapp.com. If you pick up a copy, a great review from your on the iTunes store would really help us out! This entry was posted on Thursday, October 15th, 2009 at 9:30 am You can leave a response, or trackback from your own site.